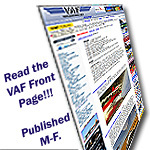 Welcome to the VAF Forums. Posting rules can be found HERE. Forum moderators HERE. 7 tail on a 6? Single axis, dual axis, installations, questions. TruTrak, Trio, Navaid, etc. EFIS, MFD, PDAs, etc. The cutting edge stuff. Traditional gauges. Installation, use, calibration, etc. uMonitor, Grand Rapids, JPI, etc. Description, installation, and demonstration of APRS trackers in RV aircraft. For questions/comments on all things interior (carpets, seats, armrests, etc). The largest concentration of RV's on the planet. One of the larger concentrations of RVs. A place to put a summary of a recently taken trip in your RV. Used to motivate others to keep building and to generate travel ideas. All about painting your RV. Prep / filling / which paints / hardners / application techniques, etc. After the FAA (or equivalent in other countries) publishes a probable cause document (PC), we encourage you to discuss it in order to learn. A place to debrief your flying, judgment and planning mistakes in a way so that others may learn. (a.k.a. 'I Cheated Darwin', 'Oh Sh%t', etc.). Similar to the 'Never Again' and 'I Learned From That' sections in some flying magazines. Get questions answered on how to best photography your flying, static or under construction aircraft. Get questions answered regarding the web site you have online spotlighting your RV project. A place to post an entry (thread) pointing to your website. This area is really just a test to see if it will catch on. 05-18-2019: EAA Chapter 846 Fly-In Pancake Breakfast, KFFC Spring Fly-In & Aircraft Spruce Supersale!, Aircraft Spruce & Specialty (East) SUPER SALE!